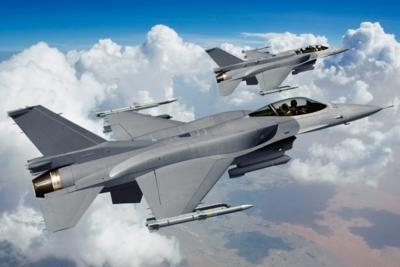 The State Department has made a determination approving a possible Foreign Military Sale to Oman of items and services to support an incremental Operational Flight Profile (OFP) software upgrade for F-16 subsystems, as well as Identification Friend or Foe (IFF) and secure communications equipment for Mode 5 operations for an estimated cost of $62 million. The Defense Security Cooperation Agency delivered the required certification notifying Congress of this possible sale this week. The Government of Oman has requested a possible sale of items and services to support an incremental Operational Flight Profile (OFP) software upgrade for F-16 subsystems, as well as Identification Friend or Foe (IFF) and secure communications equipment for Mode 5 operations on twenty-three (23) F-16 aircraft. Non-MDE items and services consist of twenty-nine (29) KIV-78 cryptographic/timing modules (twenty-three (23) installed and six (6) spares); twenty-nine (29) KY-100M cryptographic radio encryptors (twenty-three (23) installed and six (6) spares); twenty-nine (29) AN/APX-126 Combined Interrogator Transponders (twenty-three (23) installed and six (6) spares); Classified and Unclassified Computer Program Identification Numbers (CPINS) upgrades; OFP upgrades for IFF Mode 5 capable systems, Joint Mission Planning (JMPS) upgrade; Sniper Advanced Targeting Pod software, service support, support equipment, spares, and training; systems support and test equipment; spare and repair parts; publications and technical documentation; training and training equipment; U.S. Government and contractor engineering; logistics and technical support services; and other related elements of logistics and program support. This proposed sale will support the foreign policy and national security objectives of the United States by helping to improve the security of a friendly country which has been, and continues to be, an important force for political stability and economic progress in the Middle East. The proposed sale allows the U.S. military to support the Royal Air Force of Oman, further strengthen the U.S.-Omani military-to-military relationship, and ensure continued interoperability of forces and opportunities for bilateral training and exercises with Oman’s military forces. This proposed sale of items and services will enable Oman’s twenty-three (23) F-16s currently using Mode 4 IFF to become interoperable on Mode 4/5. Mode 5 IFF allows U.S. and partner airborne and surface armed forces to conduct complimentary air operations. Incremental OFP software upgrades required to support Mode 5 will provide additional incremental improvement for other associated F-16 subsystems. Oman will have no difficulty in absorbing these upgrades into its F-16 fleet. This proposed sale of equipment and support will not alter the basic military balance in the region. The prime contractor will be Lockheed Martin of Fort Worth, Texas. There are no known offset agreements proposed in conjunction with this potential sale. The proposed sale will not require the long-term assignment of any additional U.S. Government or contractor representatives to Oman.